What Is The Nerf Zombie Strike Dreadbolt? 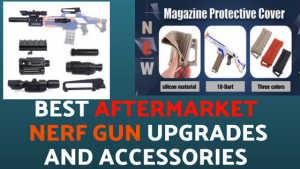 When you think of Nerf Guns, you think of Nerf Darts, but sometimes there are Nerf Guns that allow for some crazy arrows instead of just Nerf Darts! Now, when you combine arrows with The Nerf Zombie Strike Series, you end up with a Nerf Crossbow that is designed to penetrate Zombie Heads and continue on through to the next one. Line Up Your Shot And Try To Take Out 2 Zombies With One Shot! The Nerf Zombie Strike Dreadbolt is a crossbow styled Nerf Gun that fires Nerf Arrows instead of the more traditional Nerf Darts or even Nerf Mega Darts. These Nerf Arrows are shafted arrows that have a foam tip for safer firing, when loading a Nerf Arrow, make sure you pull down on the bottom priming lever (Shaped Like A Wrench), return it to the starting position and now your Dreadbolt is primed and ready for 1 Nerf Arrow. When inserting your Nerf Arrows, you will hear a confirming click and your rear priming indicator will appear orange, letting you know you are primed and ready to fire at will. Whenever you see a Zombie, aim for the head and send your Nerf Arrow right on through! The Nerf Zombie Strike Dreadbolt is a pretty unique Nerf Gun for the fact it is a crossbow that really feels like a crossbow, I mean there’s The Crossfire Bow And The Outbreaker Bow, but they are not quite as official as The Nerf Dreadbolt when it comes to actually being a crossbow, with The Dreadbolt, you use the lower wrench to prime your shot then you insert a full Nerf Arrow, when you are ready to fire, simply squeeze the trigger to send your Nerf Arrow flying! When you are looking to end a Zombie, make sure it’s a head shot, you never know when a Zombie part will come back to life until the brain is scrambled! When you are out on a hunt for Zombies or out hunting really anything, there is one nice thing about The Dreadbolt, you can store your extra Nerf Arrows right on top of The Dreadbolt, with 5 Arrow slots, you can load up and go on the hunt, you know how many arrows you have, make them count! When you need more arrows, get some tactical apparel that will help you store all the ammo you need! One thing about The Dreadbolt, the ability to scavenge becomes drastically low, when you are the only one with a Dreadbolt, you won’t be able to pick up just any Nerf Dart, it has to be an Arrow! Now, if you are prepared for this… AWESOME!!! Also, be prepared to practice fast reloading! Who Is The Nerf Zombie Strike Dreadbolt For? The Nerf Zombie Strike Series is rated for ages 8+, however, I do like to stand for Nerf Gun Fun For All, but when it comes to these Nerf Arrows, I say the age requirement of 8 is pretty spot on, however, I like to let parents make the final call whether they think their younger ones are ready to wield the power of a Dreadbolt. Put them to the test and find out their skills, do you think they should possess a crossbow with arrows or would you prefer a crossbow styled Nerf Gun like The Outbreaker Bow, that fires traditional styled Nerf Darts! When you look at the Nerf Zombie Strike Series as a whole, you can clearly see this series is meant to destroy Zombies and there are plenty of ways to do it. You can disintegrate them and make sure you shoot them so much that you can’t tell what the pieces are after you are done, you can take them apart limb by limb and have your fun after you make sure they are rendered harmless, no teeth, how can they bite you? Really anyway you can stay safe and still eliminate a Zombie is a prefect way, this world doesn’t need any more Zombies, help get rid of them! Now, when you are a Zombie hunter like myself, you may like to just go out wandering around and when you see a Zombie, just put it down, sometimes I just want to make sure this world is free of one less Zombie, quick and easy, when I take a Dreadbolt out with me, I simply find a Zombie that looks pretty dumb, get behind it, and… Put An Arrow In Its Head! However, there are times when a walking Zombie with 4 Arrows Sticking Out Of It, Is Just Too Funny! Then once it’s angry enough, come on it’s a Zombie, it’s too dumb to be angry, so once you are done with your fun, put your final arrow in it’s head and retrieve all your other arrows! I do not recommend The Nerf Zombie Strike Dreadbolt for Nerf Wars! 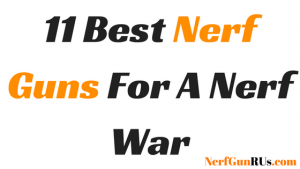 … Unless you have hunted enough Zombies to the point that you know your Dreadbolt so well, you can reload it so fast, you never miss a shot, and you are a well oiled firing machine… Well at that point, go eliminate some enemy targets in the Nerf War Zone! Maybe find a hiding spot and set up camp?! 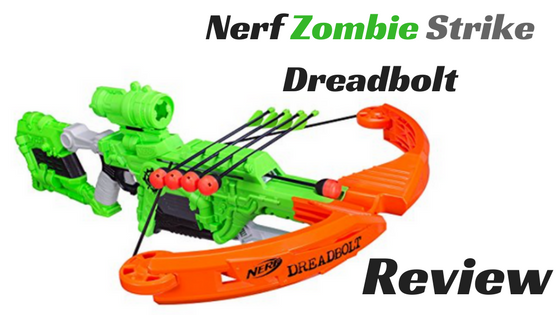 Is The Nerf Zombie Strike Dreadbolt Worth The Price? 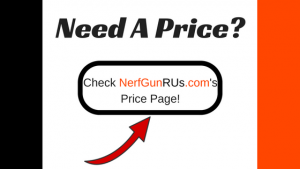 When you are looking at a price and trying to determine whether something is Worth It, well let me help you with The Nerf Zombie Strike Dreadbolt! 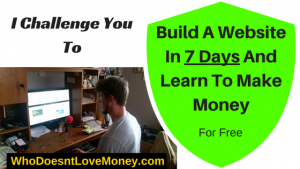 Is It Worth It!? When you are looking to own a Nerf Gun that goes beyond the normal thought pattern of what a Nerf Gun is supposed to look like and what projectiles it is supposed to fire, well The Nerf Dreadbolt fires Nerf Arrows! 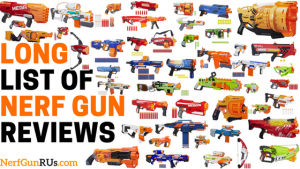 A Nerf Gun normally fires Nerf Darts, so now you have a whole new way to destroy Zombies! I highly recommended using The Dreadbolt on slower targets like Zombies because it takes time to reload in between shots, but practice makes perfect! When you purchase A Nerf Zombie Strike Dreadbolt, you get 5 Nerf Arrows, A Scope Attachment, The Bow Arms (Attached By The Firing Band) And The Dreadbolt itself. When you can successfully learn to prime, load, aim and fire fast and accurate, you will become a deadly Hunter, whether it is Zombie… or Human! Overall, Yes, I Say The Nerf Zombie Strike Dreadbolt Is Worth The Price! 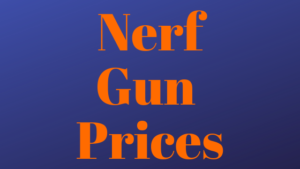 Check Out NerfGunRUs.com‘s Price Page To Check And Compare Prices! By this point of the review, I think you can tell I am a fan of destroying Zombies, I mean the undead should stay dead… What good is a flesh eating, rotting hunk of walking disgusting blehhhh…. Honestly, what’s the point? Its just going to start smelling worse and worse the longer you keep it around… Just put it down and burn the body. Maybe even salt it first? Anyways, My Final Opinion of The Nerf Zombie Strike Dreadbolt is if you are interested in eliminating enemy targets in a new way, I mean enemy targets, any enemy targets, maybe your brother is messing with you too much and you need to give him a new message… A Nerf Arrow Is Quite The New Message. 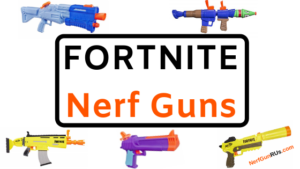 Maybe you just want to stand out and make sure whoever you eliminate, if used in Nerf Combat, knows just who eliminated them, they will know it’s the player with the Nerf Arrows fired from a Dreadbolt! Who’s The Only One There With A Dreadbolt?! Alright so when you take the bottom lever that is shaped like a wrench, you get a feeling that this Nerf Gun was just thrown together by some back yard mechanic, well that’s basically what happened, so when you pull down on your wrench to prime your Dreadbolt, the action is fairly smooth and easy to handle, once primed insert your Nerf Arrow until you hear a click and see your priming indicator on the back show orange, meaning you are set to fire. When you are convinced that you need a Nerf Zombie Strike Dreadbolt in your Nerf Arsenal, for the simple reason that The Dreadbolt is AWESOME, or maybe for the simple reason you want to stick Arrows In Zombie Heads… It Doesn’t Matter Your Reason For Wanting A Dreadbolt! When you are ready to make your purchase of The Zombie Strike Dreadbolt, Clicking The Nerf Zombie Strike Dreadbolt Banner Above Will Bring You Directly To Amazon.com Where You Can Make Your Safe And Secure Purchase, along with the option of frustration free packaging or manufacture’s packaging. 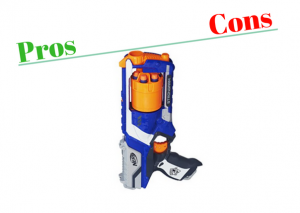 NerfGunRUs.com works with Amazon.com to make sure you find the Nerf Gun that will best fit your style of Nerf Combat and help you best in the situation you are in dire need of assistance in, with The Nerf Zombie Strike Dreadbolt, you better be ready to have some fun sticking arrows in Zombies, 4 arrows in the body, one in the head? However you decide to use your Dreadbolt is up to you! Then when you are ready, with the simple click of a banner, you are brought to Amazon.com to make your secure purchase. Thanks for taking the time to check out my review of The Nerf Zombie Strike Dreadbolt, this thing is really something else, when you think of Nerf, you don’t really think of arrows, but with the Dreadbolt, you better be ready to rethink your thinking!